Does this place look familiar to you? Can you guess where it might be? Well, let me tell you. 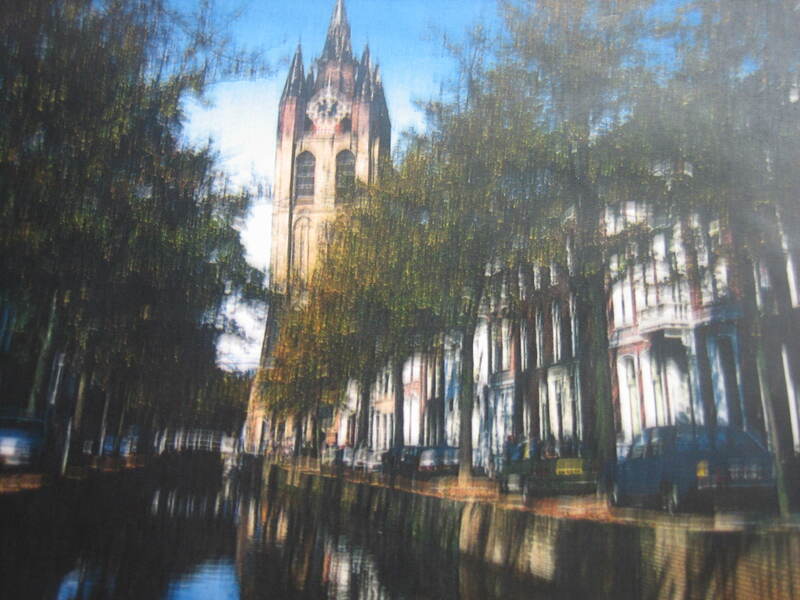 It’s Delft, a city and municipality in the province of South Holland, in the Netherlands. 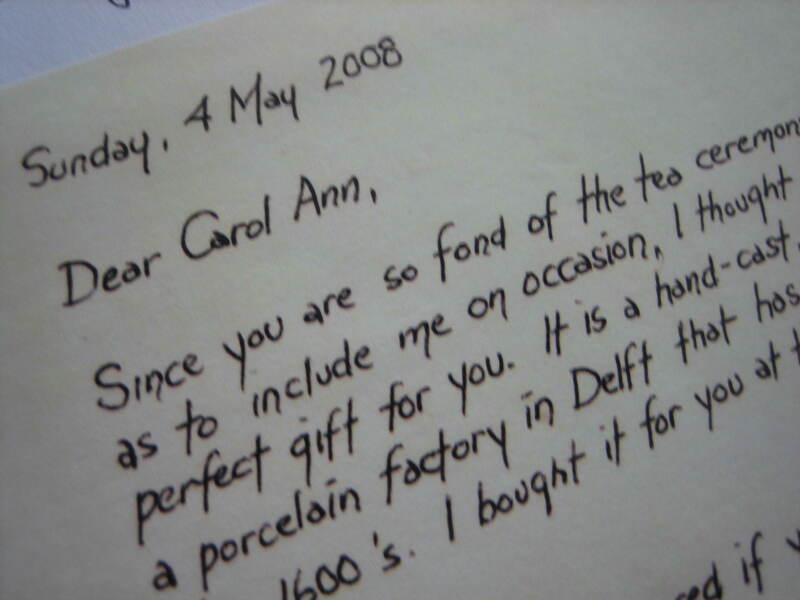 I have not had the pleasure of visiting Delft myself, not yet anyway, but my dear letter friend, James, spent some time there a while back and because he’s a kind and generous soul he shared his trip with me via letter and he bought me a little present from this charming, old city too. James bought me this beautiful tea cup. He stopped at a porcelain factory and chose this lovely hand-cast, hand-painted creation just for me. Can you imagine my delight when this beautiful object appeared in my mailbox along with the following letter? Since you are so fond of the tea ceremony, and you are so kind as to include me on occasion, I thought that this would be the perfect gift for you. 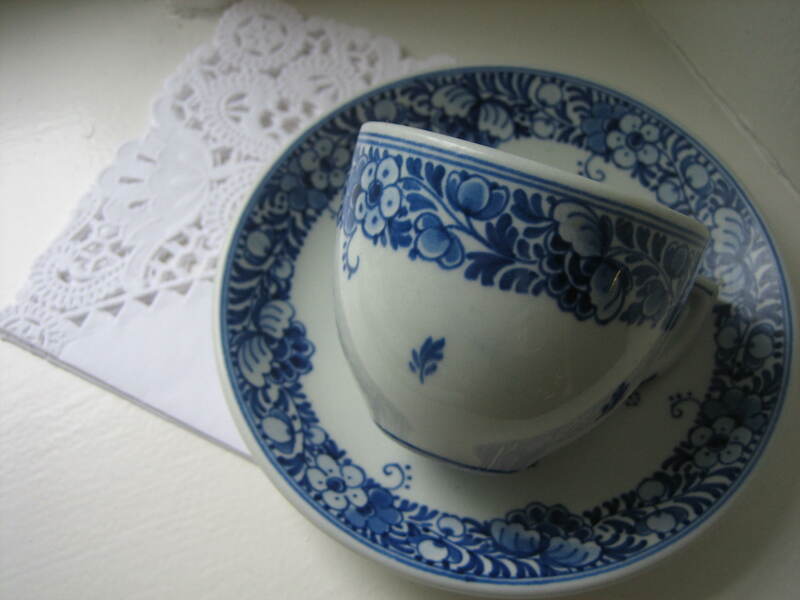 It is a hand-cast, hand-painted tea cup from a porcelain factory in Delft that has been making them since the 1600’s. I bought it for you at the factory when I was in Holland. I would be quite honored if you might use it to make yourself a cup of your favorite tea when you read my letters once in a while. Or perhaps you can put out an extra place setting with it when you invite your friends over for tea. Nobody has to know why it’s there, and that way I can be there with you in spirit. I am so honored to be included in the special brilliant world of your imagination. 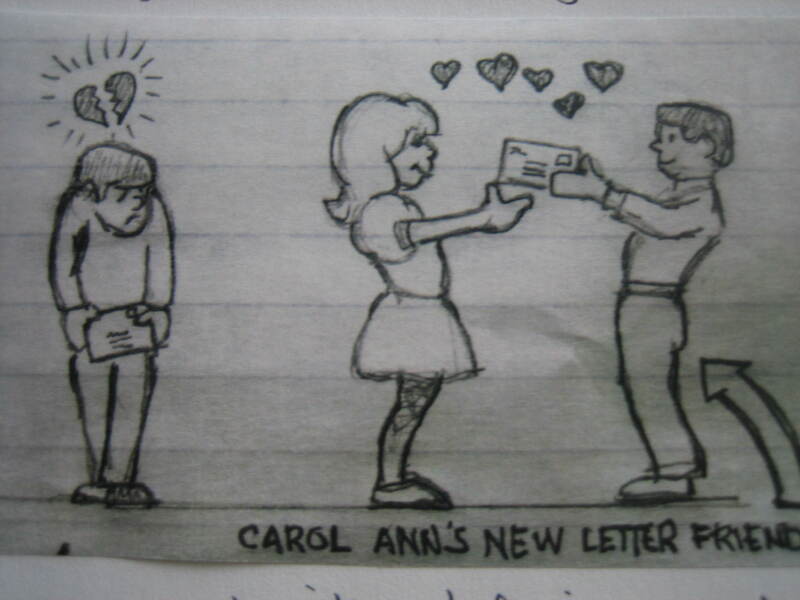 God bless you, Carol Ann. How would you feel if you received such a letter and gift? Well, I felt wonderful! Finding any personal letter in our mailbox is a delight and finding excellent letters from special friends is even better, but discovering exquisite presents sent in friendship along with very kinds words… well, this is pure bliss. I hope you have wonderful pen friends like James. Such pen friends inspire us to live richly. They validate our worth by their caring. They inspire us with the sharing of their interesting activities and appreciations. They entertain us with their stories and they teach us things too, all sorts of things. Oh yes, James is always teaching me things. 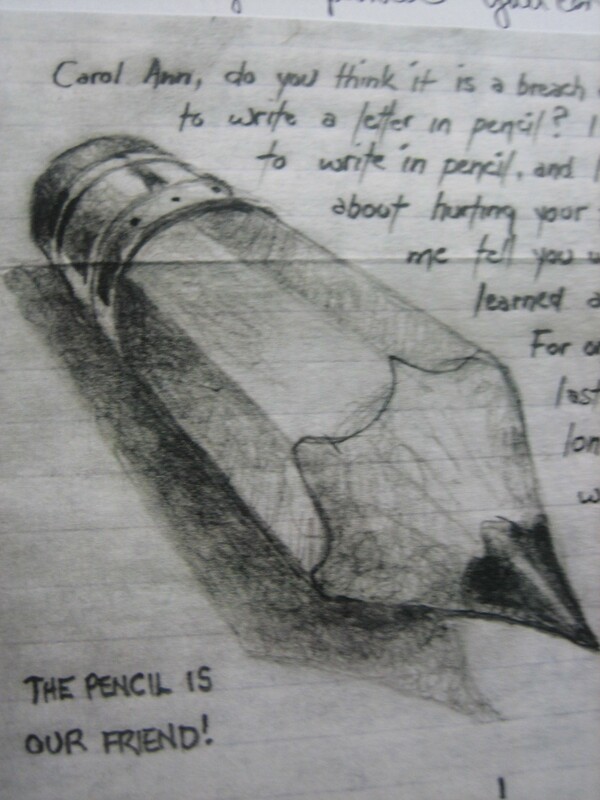 He taught me to appreciate a simple pencil like I never appreciated it before. Do you think of the pencil as your friend? I bet you never gave pencils much thought. I sure didn’t, that is until I got this letter from James in which he extolled its merits. Let me share what he had to say. Letter writers often teach us things because they are interesting people interested in lots and lots of things. Most letter writers are avid readers. When moved by the ideas encountered in a book most letter writers are eager to share those ideas. Why? You know. Sharing doubles their joy. I often write letters in my home library. There I can easily jump up, find the book I’m currently reading, and share a passage with my letter friend. I can enjoy this sharing any time of day or night too, and this is a real perk, for after all, you can’t always get a friend on the phone when you want to share or pop over to their house whenever the sharing mood strikes, but with letter writing sharing is possible 24/7. And if you happen to write to artists like my friend James you’ll delight in receiving illustrated letters. 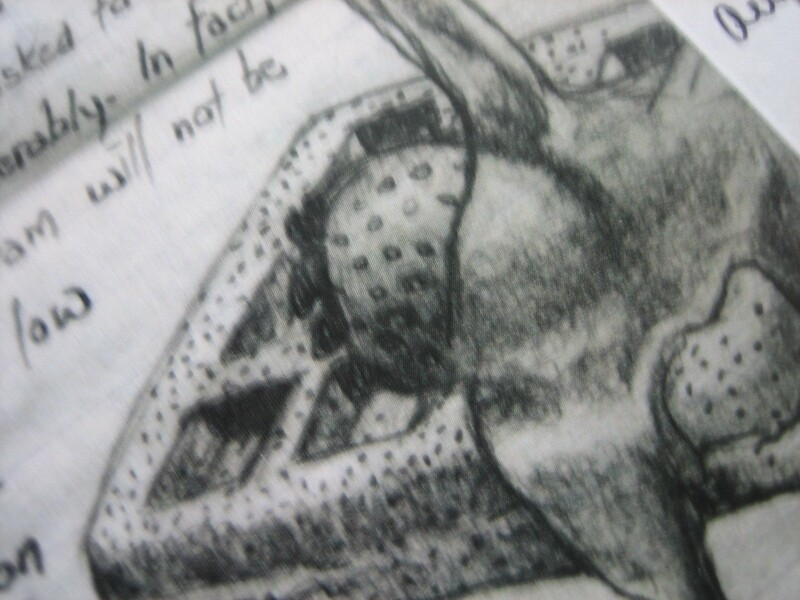 Just imagine finding drawings like this one scattered through the letters you receive. How would such drawings make you feel? They make me feel treasured. Now don’t get the wrong idea. My letters to and from James contain no hanky-panky. James knows I’m a married woman not interested in anything beyond pure and honorable friendship. I often read his letters to my husband who approves of this and all my letter relationships. The above illustration simply captures the joy a letter writer experiences when an interesting person and skilled writer becomes a new pen friend. Naturally the best correspondents are kind and good people who have something to share and are skilled in expressing themselves in words and/or pictures, but remember, practice makes improvement. If however you feel you really have nothing to share, it could be time to explore some new interests. Letter friends will provide us with lots of ideas that spark imagination and increase our zest for life as they share their adventures and favorite things with us. Here’s another fun example of sharing from James. When he was planning a trip to Belgium, all excited to be leading a tour of the Flemish and Dutch masters, he inspired me to visit my local museum so I too could view art from this period and place. That’s how the power of suggestion works in letters. And what’s this? It’s a Belgium waffle. 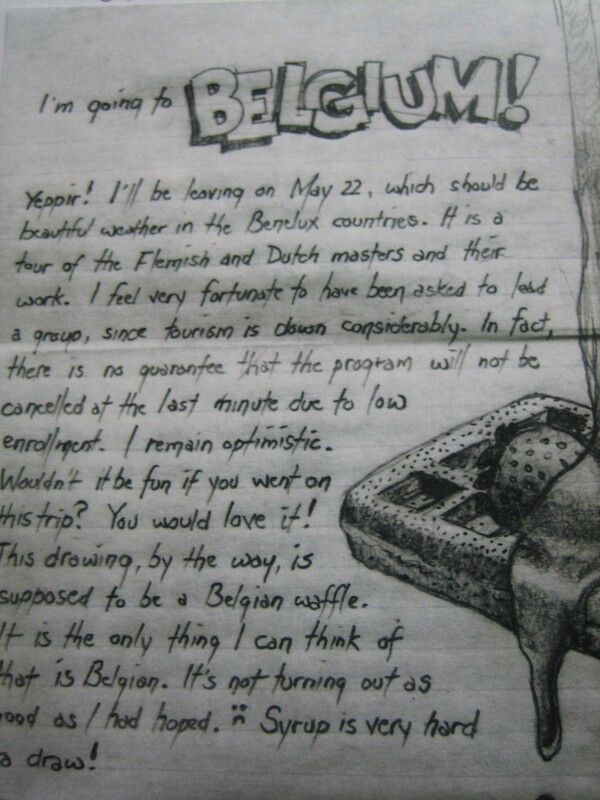 James said it was the only item he could think of to appropriately decorate the stationery for his letter about his upcoming trip, and yes, seeing his drawing prompted me to dig out my waffle maker and experiment with some recipes. Letters will be as intellectual as you and your letter friends are. They will help you think about new and different things. Letters will help you grow. They will provide a vehicle for reflection and sharing. Many of my elderly correspondents are thrilled to relive their life stories in letters, sharing those stories with new and interested ears, but no matter how old or young we are, sharing in letters doubles our joy, and, if we can’t get out often, or even if we can, letters offer great opportunities for stimulating interaction. Though the physical and social aspects of letter writing are delightful, the intellectual aspect of letter writing is equally delightful and equally responsible for making this art form a Complete Treat! You may already know this, but if not, you’ll see as you write more letters and collect more interesting pen friends, friends like James. So what are you waiting for? Write a letter!